The area is served by the Bethpage Post Office, ZIP code 11714, whose boundaries are slightly different from that of the CDP. The area is also served by Bethpage Union Free School District, Island Trees Union Free School District, Plainedge Union Free School District, and Hicksville Union Free School District, the boundaries of which include parts of some surrounding hamlets, including parts of Old Bethpage, Plainview, and Plainedge. The Town of Hempstead, on its website, includes a small part of Bethpage hamlet that is in the Levittown census-designated place. Between 1851 and 1854, the LIRR initiated a stop within present-day Bethpage at a station then called Jerusalem Station, and on January 29, 1857 a local post office opened, also named Jerusalem Station. LIRR schedules listed the station also as simply Jerusalem. Residents succeeded in changing the name of the post office to Central Park, effective March 1, 1867 (respelled as Centralpark from 1895 to 1899). The Central Park Fire Company was organized in April 1910, and incorporated in May 1911. In May 1923 the Central Park Water District was created. Following the 1932 opening of nearby Bethpage State Park, the name of the local post office was changed to Bethpage on October 1, 1936. The name Bethpage was, however, already in use by an adjacent community, which resisted suggestions of a merger and instead renamed itself Old Bethpage. The change from Central Park to Bethpage was one of the last complete name changes of Nassau County's post offices. From 1936 until 1994, Bethpage was home to the Grumman Aircraft Engineering Corporation, which made, among other things, the F-14 Tomcat, the Navy version of the General Dynamics F-111 Aardvark and the Apollo Lunar Excursion Module (LEM) for moon landings, and for this reason Bethpage is mentioned in the film Apollo 13. In 1994, Grumman was purchased by Northrop and formed Northrop Grumman. Although no longer headquartered in Bethpage, the company still retains operations there. Grumman was made famous by the performance of its F4F Wildcat fighter aircraft and its successor the Grumman F6F Hellcat, which shot down 5,223 enemy aircraft, more than any other naval aircraft. The Naval Weapons Industrial Reserve Plant, Bethpage (NWIRP) started operations in 1942, west of the Grumman site. Altice USA (f/k/a Cablevision), is headquartered in Grumman's former main office. In August 2015, a small airplane with engine trouble failed to reach Farmingdale airport, and was redirected to "Bethpage Airport" by the air traffic controller. However, the pilot could not find that airport because it was closed and had buildings on it, and the plane crashed on LIRR tracks. According to the United States Census Bureau, the CDP, or Census Designated Place, has a total area of 3.6 square miles (9.3 km2), all land. For the 2000 Census, the boundaries of the CDP were adjusted compared to those of the 1990 census, with some territory gained and some lost. Bethpage is surrounded by the hamlets of Farmingdale, Plainview, Levittown, Hicksville, Old Bethpage and Plainedge. As of the census of 2010, there were 16,429 people, 5,710 households, and 4,516 families residing in the CDP. The population density was 4,564.5 per square mile (1,764.4/km²). There were 5,788 housing units at an average density of 1,597.0/sq mi (617.3/km²). The racial makeup of the CDP was 90.8% White 85.8% Non-Hispanic White, 0.6% African American, 0.1% Native American, 5.5% Asian, 1.5% from other races, and 1.4% from two or more races. Hispanic or Latino of any race were 7% of the population. There were 5,710 households out of which 32% had children under the age of 18 living with them, 66.0% were married couples living together, 10.0% had a female householder with no husband present, and 20.9% were non-families. Of all households 17.9% were made up of individuals and 11.3% had someone living alone who was 65 years of age or older. The average household size was 2.89 and the average family size was 3.27. In the CDP, the population was spread out with 22.7% under the age of 18, 6.4% from 18 to 24, 29.0% from 25 to 44, 23.2% from 45 to 64, and 18.8% who were 65 years of age or older. The median age was 40 years. For every 100 females, there were 93.0 males. For every 100 females age 18 and over, there were 88.8 males. The median income for a household in the CDP was $70,173, and the median income for a family was $78,573. Males had a median income of $53,404 versus $36,708 for females. The per capita income for the CDP was $27,850. About 2.1% of families and 3.3% of the population were below the poverty line, including 4.0% of those under age 18 and 4.3% of those age 65 or over. As of the census of 2000, there were 16,543 people, 5,710 households, and 4,516 families residing in the CDP. The population density was 4,564.5 per square mile (1,764.4/km²). There were 5,788 housing units at an average density of 1,597.0/sq mi (617.3/km²). The racial makeup of the CDP was 94.17% White, 0.29% African American, 0.02% Native American, 2.99% Asian, 1.00% from other races, and 1.54% from two or more races. Hispanic or Latino of any race were 4.75% of the population. Bethpage residents can be zoned for the Bethpage Union Free School District, the Plainedge Union Free School District, the Island Trees Union Free School District, or the Hicksville Union Free School District. The grocery chains King Kullen and Best Yet Market are based in Bethpage. USPS also has a sorting facility in the town that serves the New York region. Bethpage is also home to the North America Headquarters of technology company LogiTag and Altice formerly known as Cablevision. Bethpage is home to two movie studios, Gold Coast Studios and Grumman Studios. Gold coast studios filmed major motion pictures such as "Spider-Man 2", "PanAm", and "Sisters" amongst others and is the home of "Kevin Can Wait". Grumman Studios has filmed "The Amazing Spider-man", "SALT" and broadcast "The Sound of Music" recently. Goya Foods has its Long Island division in Bethpage. Bethpage was the home of the Grumman plant that produced the Apollo Lunar Modules, or LEMs. Bethpage State Park offers five golf courses to choose from. One of them, the Black Course, was the site of the U.S. Open in 2002 and 2009. Tiger Woods won the event in 2002 and Lucas Glover in 2009. While the park and its five golf courses are located almost entirely within Old Bethpage and its offices are located within the neighboring Farmingdale postal district, it is easily accessed from Bethpage. Bethpage Water District was announced as the best tasting drinking water in New York State at the state fair in Syracuse in 2006. In 2010 chlorine was added to the drinking water following new Nassau County Board of Health regulations, leading many residents to complain that the taste of the water had declined. Congressional Medal of Honor recipient, Stephen Edward Karopczyc, lived in Bethpage. The former Karopczyc School in Bethpage (part of the Island Trees Union Free School District) was renamed for him. The school now houses the Island Trees Public Library. Popular Photography's Technical Editor Philip J. Ryan was also born in Bethpage. Former MLB pitcher Joe Sambito graduated from Bethpage High School. Bethpage has an ice skating rink called Town of Oyster Bay Ice Skating Center. It has two sheets of ice for skating. This rink is home to the Long Island Blues special hockey team, who practice and play home games at the rink. Al Weis (born 1938), Major League Baseball infielder. ^ a b c d e f g h "American FactFinder". United States Census Bureau. Archived from the original on September 11, 2013. Retrieved 2008-01-31. ^ "Town of Hempstead Map". Archived from the original on January 18, 2008. Retrieved 2008-01-16. ^ a b "1873 map of Town of Oyster Bay". New York Public Library. Retrieved 2008-04-07. ^ "LIRR timeline: 1898 map used as background". ^ "1906 map of Central Nassau County". Retrieved 2011-04-30. ^ "1851 schedule without Bethpage". ^ "Railroads". The New York Times. April 13, 1854. p. 7. Retrieved 2008-04-07. ^ a b c David Roberts. "Nassau County Post Offices 1794–1879". Retrieved 2007-12-23. John L. Kay & Chester M. Smith, Jr. (1982). New York Postal History: The Post Offices & First Postmasters from 1775 to 1980. American Philatelic Society. 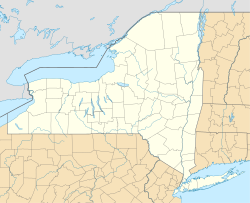 ^ Jerusalem was a community to the south, now called Wantagh. One of the reasons later given for changing the name from Jerusalem Station was that residents wanted to establish an identity of their own that did not depend on their being a station for another community. ^ "1863 LIRR timetable". Retrieved 2008-04-07. ^ The schedule shows the stop is 2 miles from Farmingdale and 3 miles from Hicksville, the same distances for the existing Bethpage LIRR station as of 2019. ^ Central Park in Manhattan had opened in 1859. ^ "RECORD OF DECISION Northrop Grumman" (PDF). www.dec.gov. March 2013. Retrieved April 9, 2014. ^ "Encyclopedia of the Unincorporated Village of Bethpage". January 21, 2006. Archived from the original on August 30, 2008. Retrieved 2012-04-20. ^ "Contact Us Archived April 24, 2011, at the Wayback Machine." Goya Foods. Retrieved on March 26, 2016. "Goya Foods of Long Island 201 Grumman Road West Bethpage, NY 11714"
^ "Long Island Blues Hockey Club powered by GOALLINE.ca". Longislandblues.org. Retrieved 2014-08-03. ^ "Governor Cuomo Orders Engineering Investigation to Expedite Containment of Long Island Groundwater Plumes". ^ "DEC Outlines Remediation Plan For Bethpage Plume". Antonnews.com. June 29, 2012. Archived from the original on August 10, 2014. Retrieved August 3, 2014. ^ Author. "Blog Series: Letters to Grumman from the Bethpage Community, Part I". Bethpage Cancer Project. Retrieved 2014-08-03. ^ Emily Dooley. "Bethpage Residents File $500M Lawsuit Against Northrop Grumman". Newsday. Retrieved 2018-12-12. Wikimedia Commons has media related to Bethpage, New York. Wikivoyage has a travel guide for Bethpage.